Mercury President, John Pfeifer visits Bangor Northern Ireland to present Whale with the prestigious 2016 Brunswick Chairman’s Safety Award in recognition of their outstanding Health and Safety performance. President of Mercury Marine, John Pfeifer visited the Whale facility in Northern Ireland to present the workforce with the prestigious Brunswick Corporation’s Chairman's Safety Award. The purpose of the programme is to recognise and reward employees and facilities that have achieved outstanding safety and health performance through promoting and practicing safety awareness, ultimately minimising workplace incidents and injuries. The Brunswick Chairman's Safety Award is selected and presented by Brunswick senior management to the most outstanding performers. 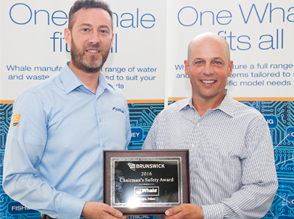 Whale was one of three Brunswick owned facilities worldwide who won the Chairman's Safety Award in 2016. In conjunction with the award, Brunswick has also donated US$10,000 (£7,700 GBP) to Whale’s chosen charity, Cancer Focus NI. The organisation provides support to those diagnosed with cancer and their families in Northern Ireland. “We are delighted and honoured that the Whale team has been recognized with such a prestigious award by Brunswick Corporation for our approach to health and safety systems and our excellent safety record. It is a reflection of the entire team’s commitment to continuous improvement and with the support of Brunswick Corporation we will continue to strive to create a safe, efficient and positive working environment for everyone involved in the business. We are also very thankful that as a result of being awarded the prestigious 2016 Chairman’s Safety Award, the organisation has generously donated $10k to Cancer Focus NI as our chosen charity. Our workforce has benefitted greatly from the cancer prevention initiatives that the organisation runs. We also have a number of team members who have or are going through cancer treatment and so it makes this donation all the more personal to us." 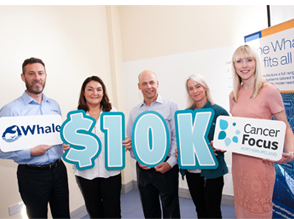 “Thank you so much to Whale for choosing Cancer Focus NI and putting so much effort into their well fare programme. Cancer Focus NI is a local cancer charity that provides a wide range of services for Northern Ireland cancer patients and their families. These include counselling and family support, bra and swimwear fitting for mastectomy patients, art therapy, Beauty for Life, stop smoking services and Keeping Well vans providing community health checks and advice. The charity also funds major research and carries out cancer prevention schemes in workplaces, schools and at community venues. This donation will help to continue our FREE services, helping cancer patients and their families across Northern Ireland."